The Bodhisatttva’s Embrace retails for $15. Lots of ways to get your copy. Order by clicking on the PAYPAL BUTTON ABOVE, by mail from Clear View Project, 1933 Russell St., Berkeley CA 94703, from our website (see below) or online from Amazon.com. From Clear View, individual copies $15/each; postage & handling $3 total–for one or more copies! 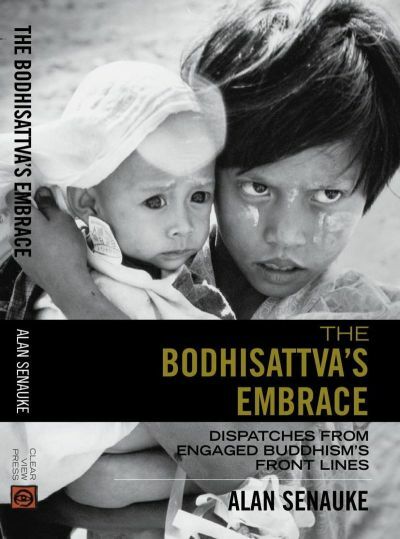 I am happy to announce my book of essays – The Bodhisattva’s Embrace: Dispatches from Engaged Buddhism’s Front Lines. The Bodhisattva’s Embrace assembles pieces I have written over the last twenty years of travels to troubled places in Asia and the U.S., along with dharma reflections on the suffering we all see and experience. I have also included some of my photographs, relevant to the writing. The book is available here – see the button above – from Amazon.com, and from select local bookstores. And feel free to make a donation directly to Clear View Project supporting our work. Click on the “Home” page of the Clear View site. Here is what Buddhist activists and writers are saying about The Bodhisattva’s Embrace. For friends and followers of the Dharma, this collection illumines the promise of our practice and its relevance to our world today. Shorn of sentimentality and electric with caring, Alan Senauke is a trustworthy guide. His essays serve me both as reports from the field and inspirational reading. Hozan Alan Senauke writes beautifully of his heartfelt experience and commitment to engaged Buddhism. Reading his words, one can see the path of a Bodhisattva in this age of globalization. More adeptly or more powerfully described. I am so grateful to Alan for his work and words. – Roshi Joan Halifax: Upaya Zen Center, anthropologist, author of Being with Dying. Over the years I have treasured my friendship with Alan. Sharing with me the many stories in this book, he has carried me along with a sense of compassion I continue to learn from. His travels are, in truth, a journey on the path of a bodhisattva. Read this book and you can see what it means to genuinely be of benefit to all beings. Alan takes us on a journey from the 1960’s student protest to the streets of Burma as he bears witness to the world’s suffering and works to heal it. Alan Senauke is one of the founders and wise elders of socially engaged Buddhism in the West. Read these essays and you’ll know why.